Thomas Piketty’s “Capital in the 21st Century”, published in 2014, played an important role in directing attention to the issue of inequality in the developed economies of the 21st century. The book was both praised and criticised from many parts of the political and economic spectrum. Least controversial was his laying out of the evidence that inequality of both income and wealth has increased markedly since the 1970s, particularly in the US and the UK. A little more controversial is the suggestion that this increasing inequality is harmful to the societies of those countries. Most controversial, and more technical, was Piketty’s espousal of a ‘fundamental law of capitalism’ that when the return on capital (r) exceeds the rate of economic growth (g) inequality will increase. The chart below shows the change in the fraction of total income going to the top 10% of the distribution for 1900 – 2010. Economic inequality might be a natural outcome of features that we do (or should) value too greatly to tamper with such as freedom or the incentive of the profit motive, and simply reflect innate differences between individuals that result under these otherwise beneficial conditions. Moreover, incentives that lead to inequality are argued to be essential to a dynamic innovative economy which raises living standards for all, including those at the bottom of the income and wealth pyramid. Often there is the argument that the wealth of a minority does not impact on the majority – since resources are not finite, and the incentive effects of the ability to become wealthy creates additional wealth. On the other hand it seems obvious that there comes a point at which there is too much inequality even if we aren’t currently at that point. Few people would consider it acceptable for only a handful of people to hold all wealth. And while it is true that total resources are not necessarily finite in the very long run, individually and in the shorter run they frequently are. Even where resources are growing it is possible for them to be accruing to the top of the distribution faster than the total quantity increases, in which case the rest are making do with less. At some point the costs to a majority (who are by definition under inequality more numerous than the very wealthy) of upsetting the current order will appear to be less than of allowing it to continue. How this takes place and when is of course inherently unpredictable but will depend on the type of governance regime in place and the physical and informational barriers in place between the wealthy and the majority. In the absence of formal pathways to change and redistribution violent disturbance becomes a possibility, particularly if the majority feel they have little to lose. Wealth is acquired in two main ways. Firstly, it is acquired as “labour income” where there is a clear connection between services performed by an individual and the reward they receive – usually in monetary form. Secondly there is capital income which is the “reward” obtained from the ownership of material goods or from proxies for material goods such as money or financial assets such as stocks and bonds. In the US the top 10% of earners receive 35% of labour income, and the top 10% of capital owners have 70% of the wealth. 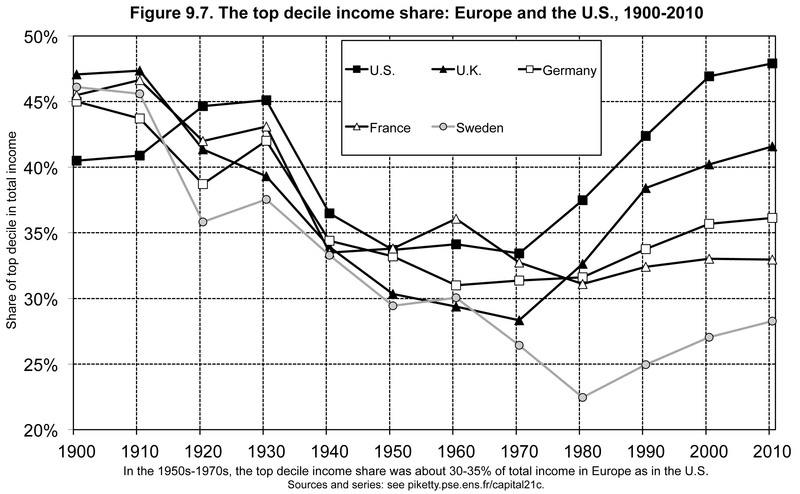 Piketty has outlined the rise in inequality (especially wealth inequality) since the 1970s. In particular he is identified the tendency for executive income and income from wealth to drive inequality. The core of his argument around wealth is that high returns to it allow the accumulation of this wealth to proceed faster than the productive capacity of the economy as a whole. Since income from wealth increases in the size of that wealth, and income from labour increases in the size of the overall economy then high relative returns to wealth increase inequality between wealth holders and wage earners. Without going into the technical aspects Piketty probably obscures as much as he reveals, in that returns to labour and wealth are actually driven by the same or by analogous parameters – advances in productive technology and increases in the quantities of capital and labour that each respectively have to act on. What truly distinguishes the impact of wealth is that it can be concentrated in a way that labour power clearly cannot be. The forces tending to concentrate wealth – inheritance, the power to save and thus build up the generating base, and the wider influence of wealth on political and legal advantage, appear to be greater than those tending to its dispersion – capital and inheritance taxes, rules on political donations and tax avoidance. While Piketty addresses executive pay increases, I believe he ignores an important factor in this which is that while executive pay is nominally a return to labour it is effectively a return to capital. Since executives are paid on financial criteria by those with the largest financial interest in firms and on the recommendations of their peers, the level of this remuneration is not governed by any form of labour market mechanism but in relation to the residual profit of the firm, or of the return to the firm’s capital. The categorisation of executive pay as labour income lies in a false dichotomy between legal ownership and the effective control of wealth. Since evidence does not support the conclusion that better executives are higher-paid, executive pay should be seen as a return to capital at least as much, if not more than, as it is a return to labour. Thus both the main drivers of inequality can be seen as consequence of the ability of capital ownership to be concentrated in a way that labour ownership cannot be.